I love what I do. I love Spanish, and teaching, and I love watching students “get it”. I also love presenting, and how I have a platform to share my journey with other teachers, but y’all, teacher burnout is a real thing. Last year was a crazy year for me, and after my SCOLT presentation, I came back and pretty much hid in a hole and tried my best to make it to June. It was just a slow-rolling meltdown to the end of the school year, with a whole summer of school curriculum writing and STARTALK curriculum & program facilitation ahead of me. It was the first summer I’d put my kids in summer camp instead of being home with them all summer, and that combined with everything else had me really questioning my choices and feeling like I had nothing to share. 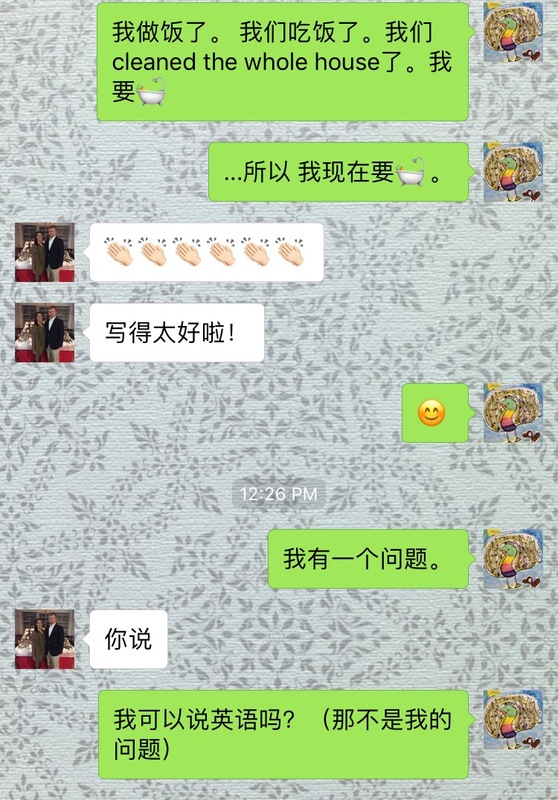 Then, the coolest thing happened… I started learning Chinese! (No, really, I did!) I’m kind of obsessed with it right now, as anyone who knows me will tell you. 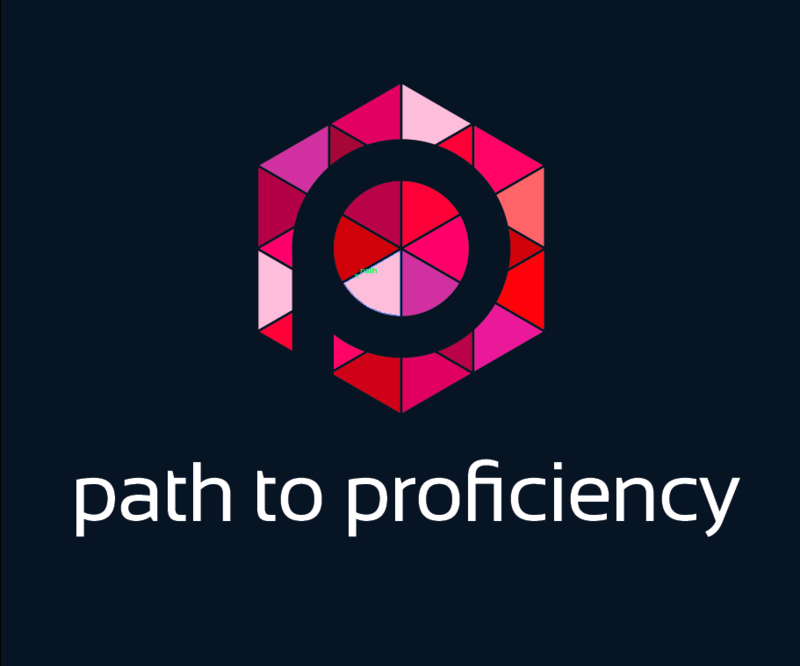 In all seriousness, I can tell you that the process of rediscovering my love of language learning snapped me out of my funk, and it has led me to think about a few applications for my own classroom which I’d like to share with you. My students need their intellectual curiosity stimulated to work towards learning a new language. They need a puzzle to figure out, or a pattern to see, because once they get the rush of being right, they’ll want to try to do it again. 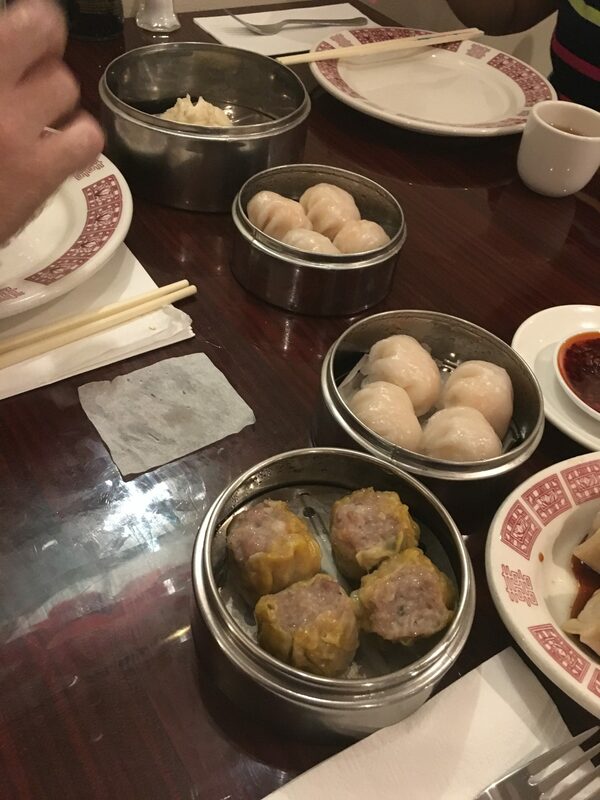 This all started when Matt Coss, one of the Chinese teachers from a local STARTALK program and an awesome new blogger on this site, and I went to on a field trip to the Asian market to plan part of our student field trip. As we walked around, he in his element and me just kind of along for the ride, he started to point out things about Chinese characters in the products we were looking at. It was like a Novice Low Interpretive Reading exercise in a class, but so much better! I was in an authentic market, looking at authentic products, identifying characters and parts of characters I recognized in their contexts! Let me tell you, as I started to figure it out, I was hooked! 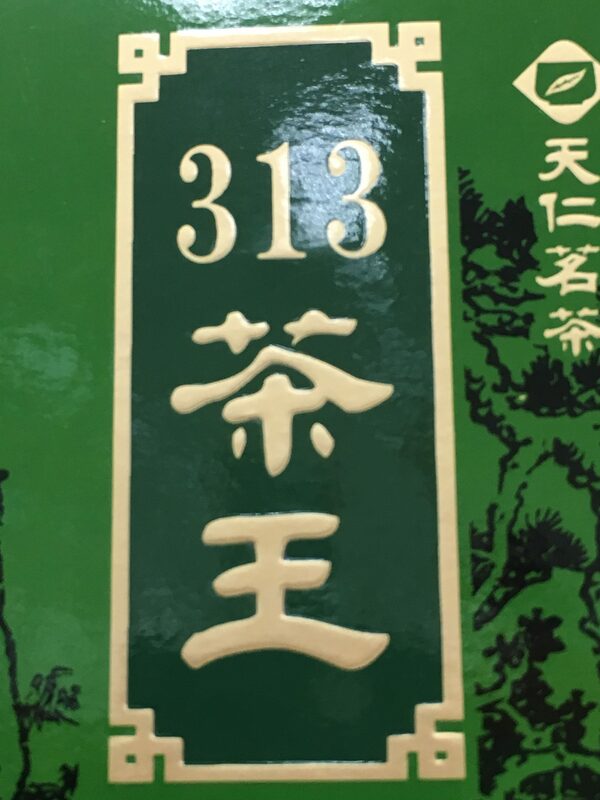 (The character under the numbers means tea, by the way) It was the excitement of looking at a Chinese character and actually knowing what it says: that real Novice rush you get when input that didn’t make sense suddenly does. From that point on, as I started to learn characters, any input was fair game. While Dr. Strange was making time stand still in Hong Kong, I was looking at the characters on the signs in the background. 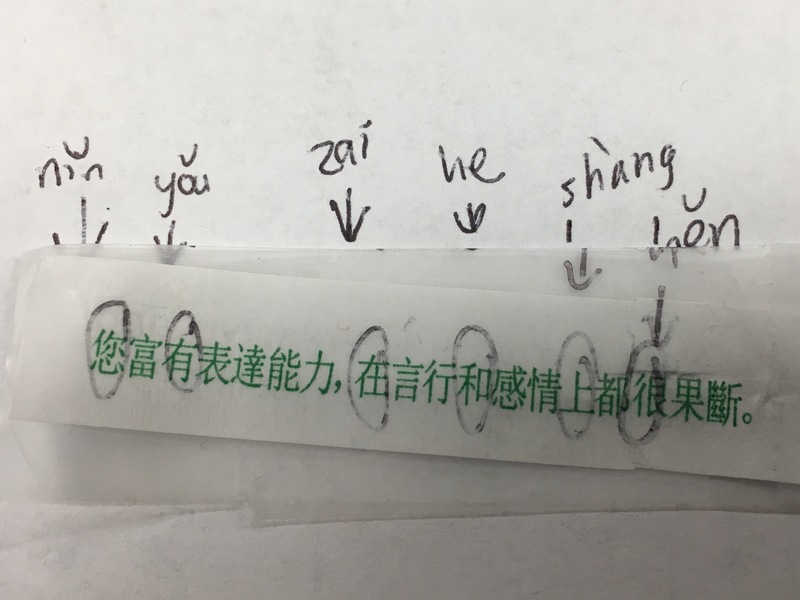 When I opened a fortune cookie from my favorite Vietnamese restaurant (yeah, I don’t know either) it had Chinese characters on the back and I immediately circled all the characters I recognized, wrote their Pinyin above to prove it, and sent a picture to Matt. One of the Chinese apps on my phone was all about listening and reading texts. There were some texts that were really short and manageable for my level, so I picked a few of them to read. I was so excited when I realized that I understood what it was saying! The app even reads to you so you can hear the pronunciation, and puts the pinyin (pronunciation guide) on top of the characters if you need more support. The fun part was that I was choosing reading material at my level on topics that I knew I could probably handle, so I was experiencing success on my own. 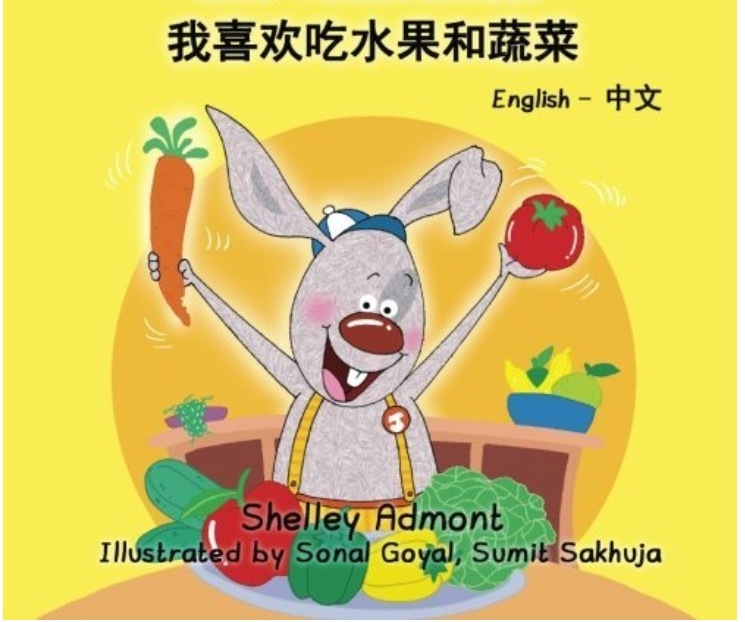 I was even finding children’s books on Amazon that I could read in Chinese that were on my familiar topics. My students need to learn language around their own personal content and to some extent, on their own terms, so they have buy-in and can maintain their interest in using the language. I needed to expand my vocabulary in Chinese with the vocabulary, phrases, and language structures that I needed to talk about what I wanted to talk about, but where to start? So, of course, there’s an app for that, right? 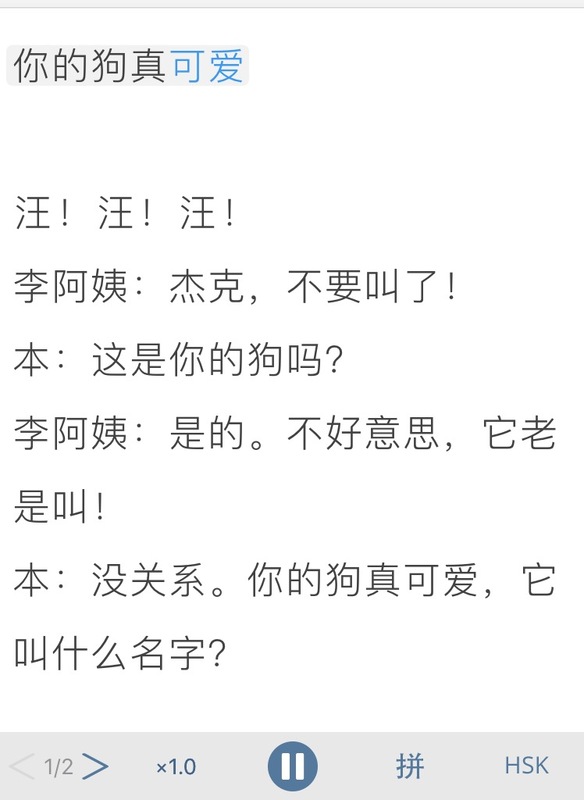 I downloaded a few free Chinese apps on my phone that did some basic greetings and things in Chinese (most with translations, some with pictures), and I learned the word my name is, his/her name is, a few animals, and a few other things. 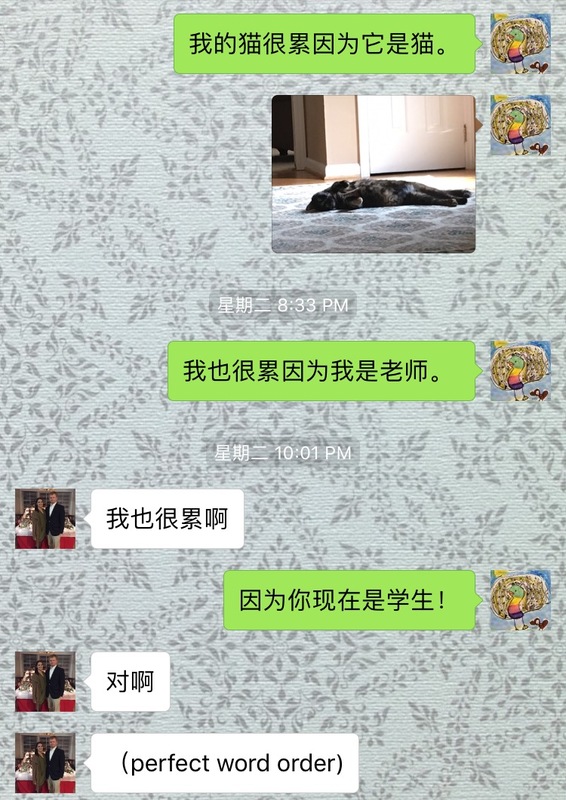 Then I put a Chinese keyboard on my phone, and since we were already texting about STARTALK teaching, I sent Matt a text in Chinese about my dog! 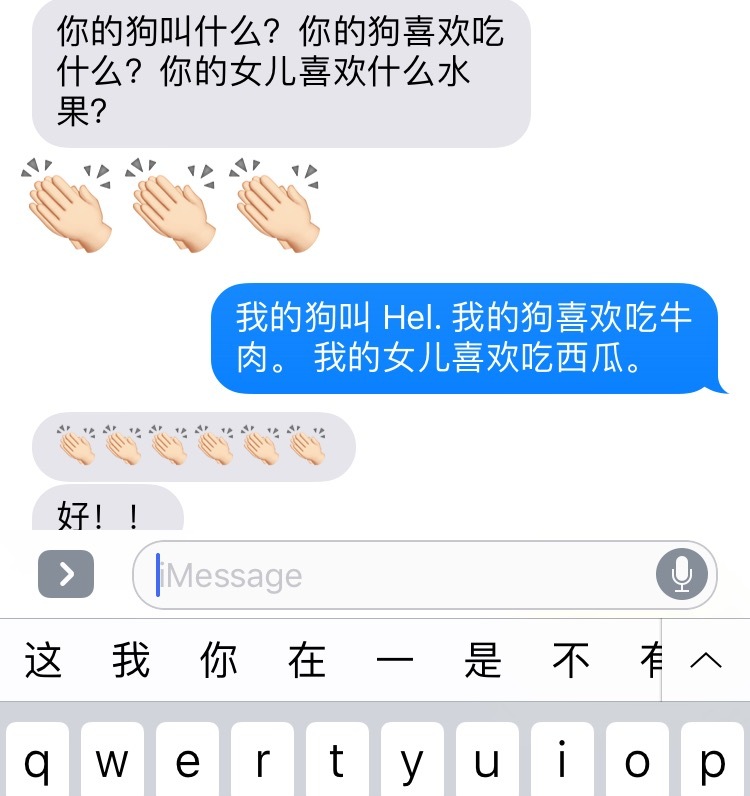 And he responded in Chinese! So we had a (very limited) conversation about our animals’ names. That first conversation about my dog continued to include the puppy we adopted right after that. As I learned vocabulary with my app, looked up more vocab in an app dictionary, and asked Matt for simple structures, I could do slightly more with my conversations than before. I could answer a question and add a detail or two. The more I talked about the topics that were close to my everyday life experience, the more I felt invested in my use of the language. 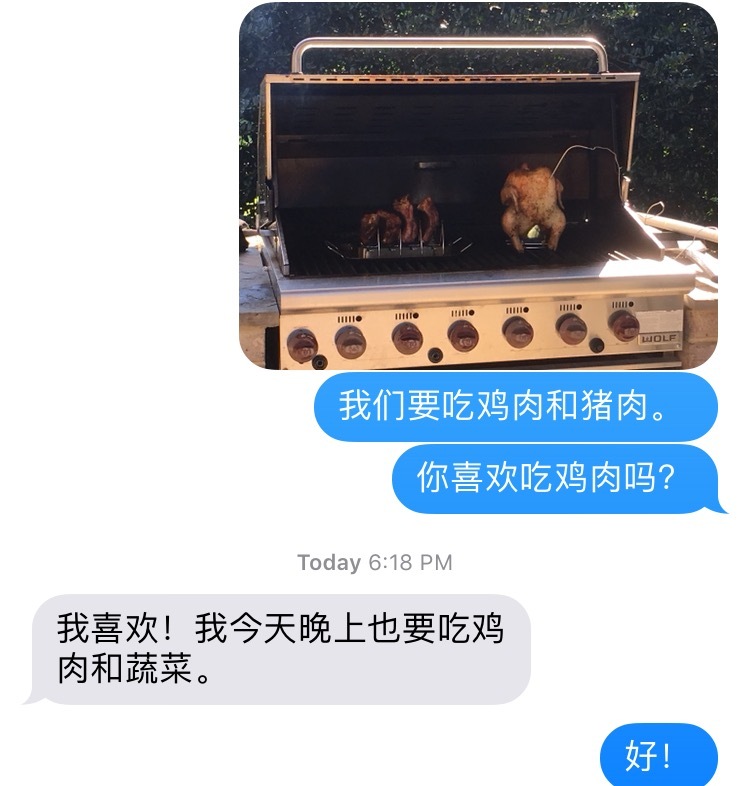 I sent pictures of the barbecue we went to at my friend’s house. 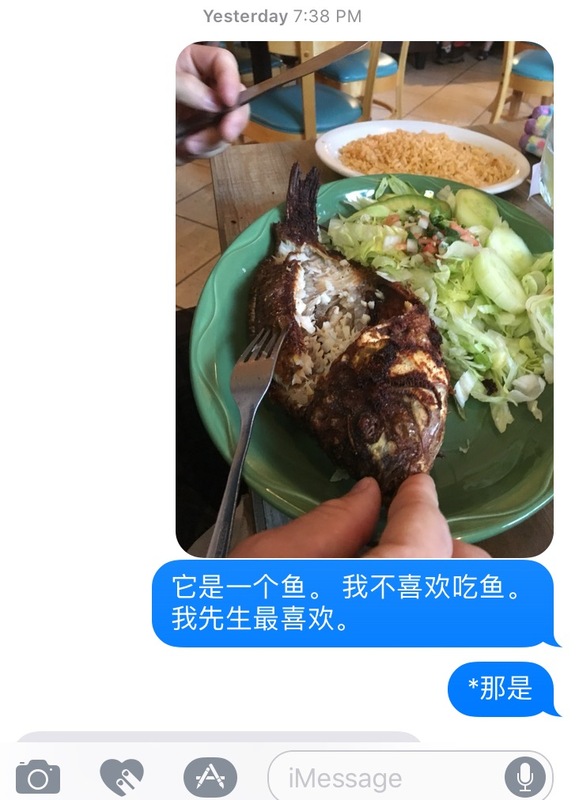 I sent pictures of the fish my husband was eating at the Mexican restaurant. I learned colors and then tried to explain the colors of my cats as they hung out in the den. Pretty much anything I had the language to talk about, I sent captioned pictures about. 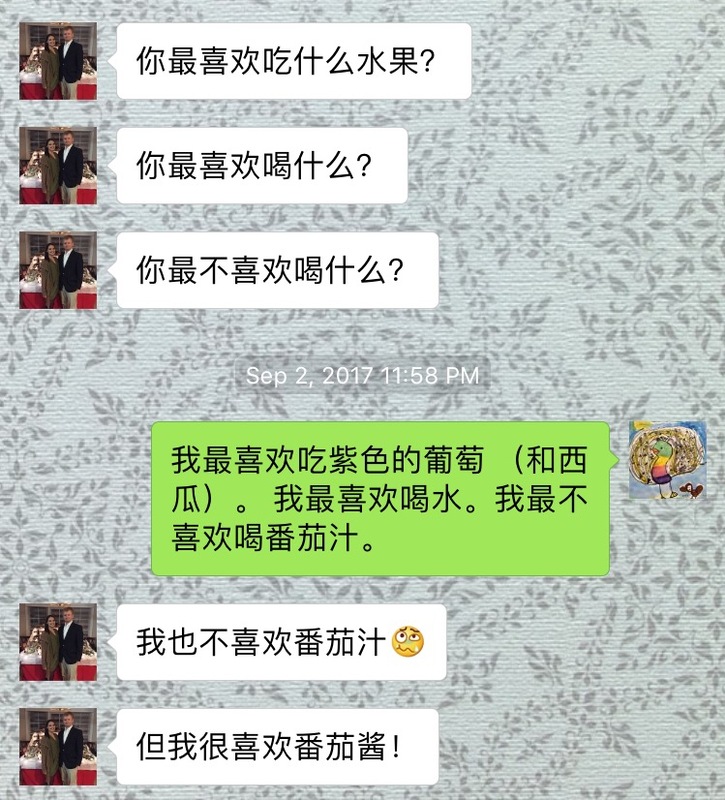 I was so excited that I could look at a situation in my life and be able to use Chinese to explain it, that it drove me to use more Chinese. I would really like to do a project with my students this year where they just do this all year, related to their own lives and interests, and watch how their language evolves. I wanted to talk about anything I could, and I remembered the words because they were close to my experience. Novices deal in familiar topics, right? My students need someone real to talk (or text) with who will be positive with them and show them that they can be understood. The coolest part of this experience was talking with a real person who was so excited about my learning Chinese. I was constantly receiving positive reinforcement when I tried a new structure, or had correct word order, or gave a shot at answering a question. The fact that I was texting in real time with a person and that person was responding, gave me confidence that my messages were comprehensible (even though not always correct). It also made me strive for more vocabulary and more structures because I wanted to be able to share more information and understand more of the texts I was receiving. I think that even beyond that, I wanted to be able to connect with the person I was talking to on their terms, and when I was able to and got positive feedback, I was more willing to try again. I have already applied this idea with the question function of Google Classroom, where I typed in a question for the class and gave the students the ability to respond to each other. We all spent 5 solid minutes “texting” back and forth, answering each other’s questions, and responding with follow up questions and comments. 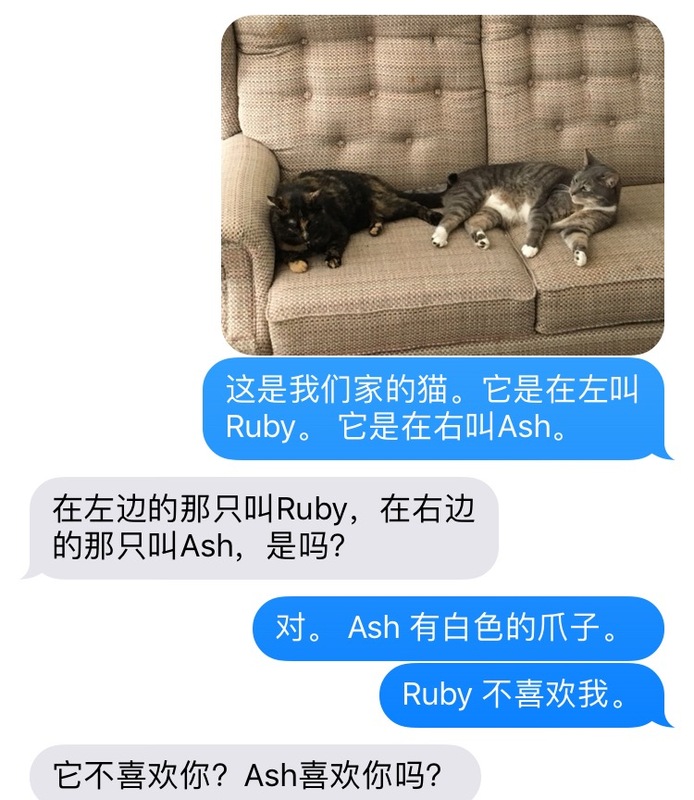 They thought it was really fun, and it simulated (albeit frantically) the texting practice I had in Chinese. I want to find a way to do this same thing but with a native speaking partner instead of my students all “texting” each other. Student need immediate feedback for three reasons: 1) to validate their attempts to use language, 2) so they know they are “doing it right”, and 3) so they can be provided with the correct word/phrase/structure to do it better the next time. Immediate feedback was a great thing that worked in my 1-on-1 texting-teaching experience over the summer, and I’m really trying to figure out how I can make it work for my students. 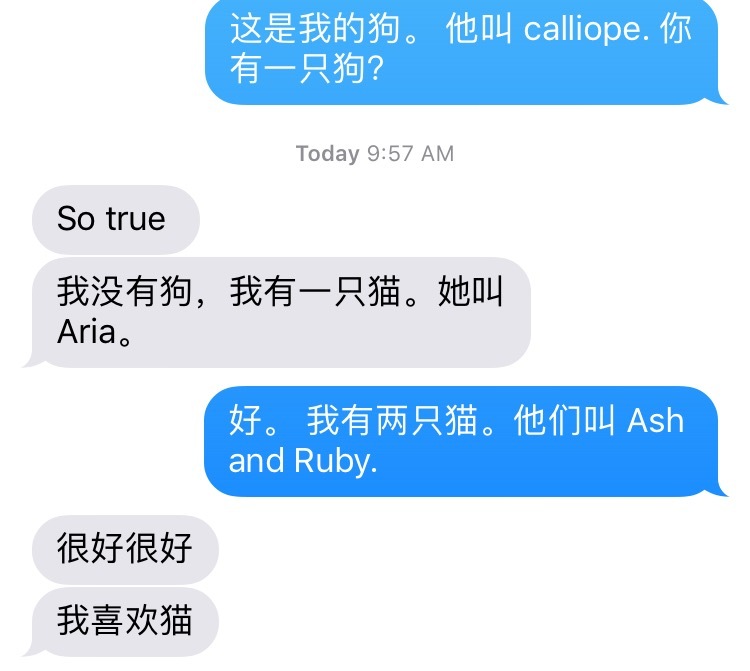 I would text Matt my attempt at language, and then I got instant feedback with a response in Chinese. If my statement was wrong, sometimes I’d get a response back as a question with the right characters in it instead, like a recast of the correct language, so I could try again. Other times, there would be a correction in English explaining why I did it wrong and what I needed to fix to make it better, or something simple like “word order”, so I knew I had the right characters but wrong order. 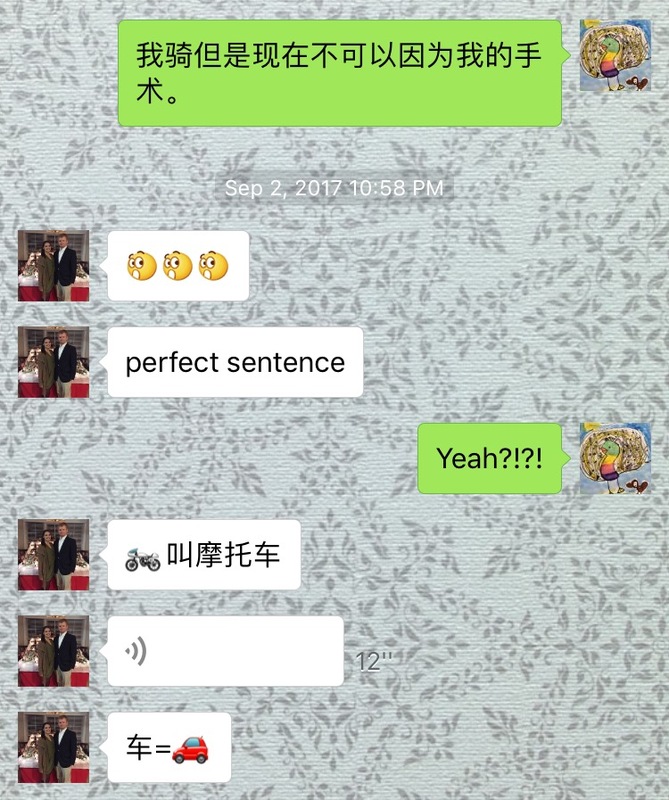 If I did it correctly, I’d get a positive response in emoji or Chinese and a phrase like “perfect word order”. Now, the problem with this in the classroom setting is obvious, right? Lots of them, one of me. Giving meaningful feedback takes time, so it’s rare that it can be immediate in the same way as directly texting a person and receiving specific explanations and error correction. What I want (I think) is to listen to their recording and just to be able to record my response back to them with my initial impressions and maybe 1 specific thing to work on. I think that would be manageable for multiple classes. Students need to be exposed to so much target-culture related input via products and practices that they get inspired to experience it on their own. I drink tea now, which I’ve never done before. I bought a teapot and tea, and I drink it every day, so much so that I’ve basically given up coffee. 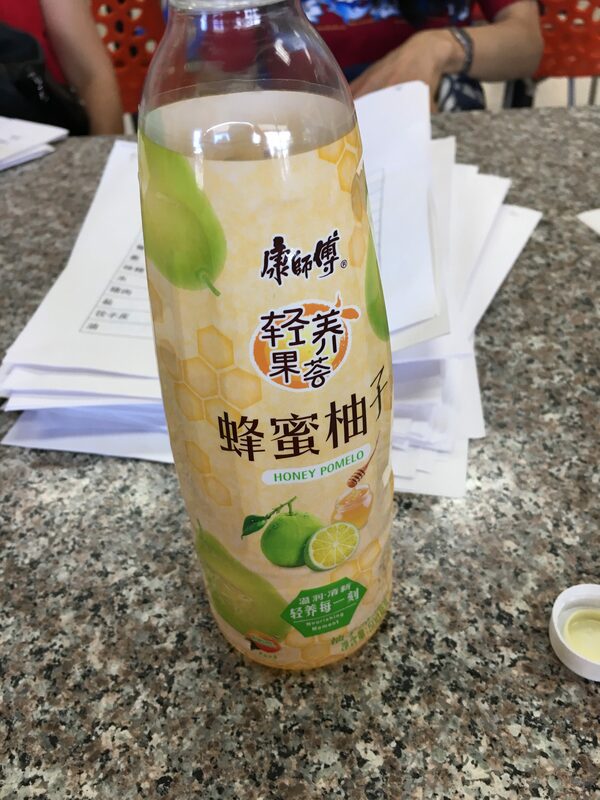 I go to eat dim sum instead of ordering Americanized Chinese food, and my new favorite drink is honey pomelo. I am also searching through my Netflix for movies in Chinese that I can watch so I can listen to the words and read the subtitles. 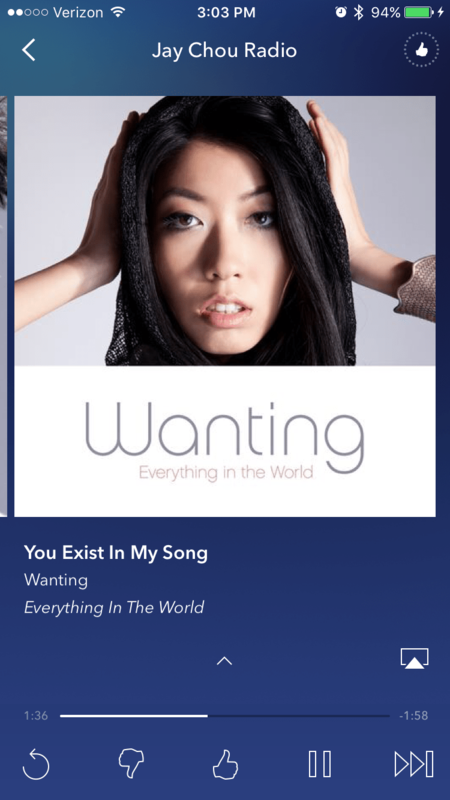 I have also found several artists on Pandora stations in Chinese that I listen to now, and you can’t imagine how excited I get when I hear songs I recognize. I get the lyrics in characters and listen to the songs over and over “reading” the lyrics. I don’t know what they say since I don’t have enough vocabulary to really make meaning out of much of it, but when I hear/read the phrases I do know, it’s an empowering experience (plus I like the music). I took my best friend with me to Grand Asia (the market) yesterday and we walked down all the aisles and I showed her all these things I like to eat and drink now. I even showed her characters for tea, rice, fish, fruit, and a few types of meat like the language nerd I am. Even though I really can’t speak much to anyone when I’m there, I don’t feel even remotely as “along for the ride” as I did when this all started. That’s what I want to be able to give my students. I want to create such a culturally-rich environment for them in class that they get hooked and want to explore the language and culture on their own, the same way I did with Spanish when I was 15, and am now doing again with Chinese. I realize that it’s not realistic to think that every language teacher who is overwhelmed and facing burnout will just magically jump into learning a new language as the solution, but what I found for myself was that going back into that exciting Novice mode of struggling and being excited to try to make meaning really brought me back to life. It has made me want to make things better for my own students because I am 100% in their shoes every day. They laugh at me and say “Sra. 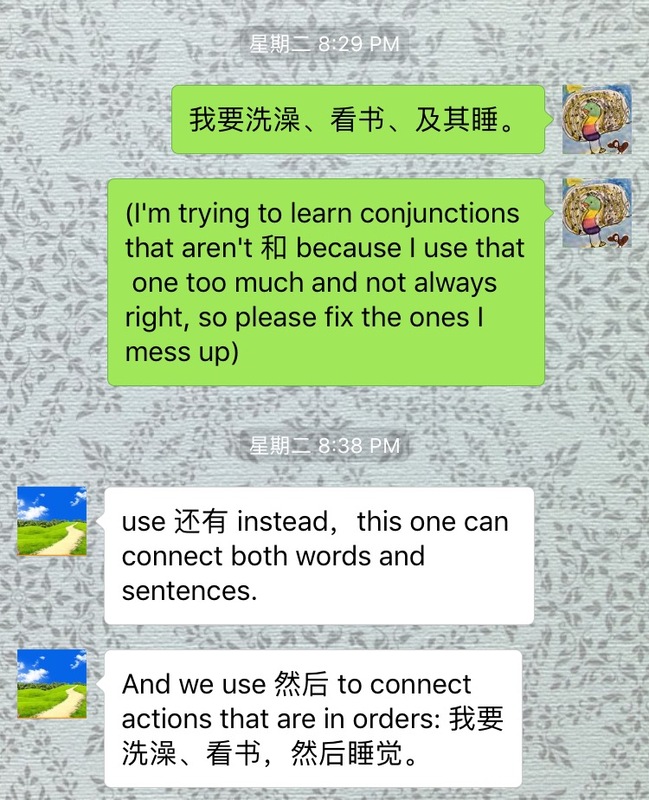 Rhodes, you talk about Chinese all the time”, and that’s probably accurate, but when I talk about learning Chinese, I’m explaining to them how I’m stuck on a particular word order that I can’t get right, or trying to add a connector and using the wrong one, and other issues that they have in Spanish! It’s fun to have something in common with the language learners I’m teaching, and instead of just trying to get content to them, thinking about how I would find it most helpful in my language learning. I hope you enjoyed seeing this glimpse into what I did on my summer vacation, and that you have a great year learning something new with your students. I’ll leave you with this last story of my life. I hate papaya. Growing up in Hawaii, my grandmother ate it every single day, and I hate everything about it: the smell especially, but also the taste, the texture, everything. When I learned how to say “I really don’t like to eat…” I immediately thought of papaya, so I learned that word. Since then, I have found so many papaya-related things in the Chinese market: fruit, juice, cookies, ugh… so every time I see one, I remind myself how to say “I really don’t like papaya.” and send that picture and phrase in a text. 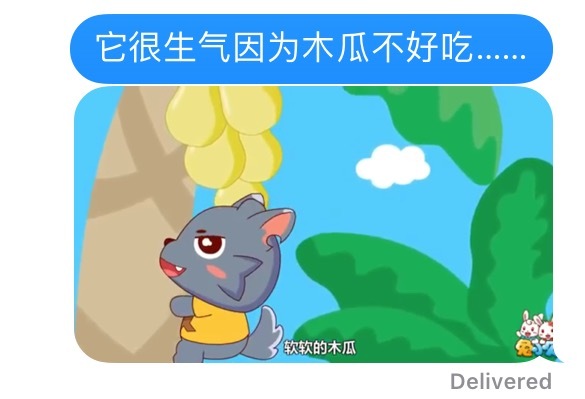 Finally, I found this cartoon with this very angry animal climbing up a papaya tree, and I kind of made a joke, in Chinese! It made me so happy, and I hope this year I can give my students what they need to get to this happy mode in their language learning. Hope this helps! Have fun! That’s super awesome! I’m learning Chinese as well, and I could understand a lot of the messages between you and the other person. It’s very exciting to be a Novice level learner again; it makes you appreciate what we may take for granted with our students.